You can download my software from this page. If you find it useful, please consider a donation – as much as you find it’s worth for you. 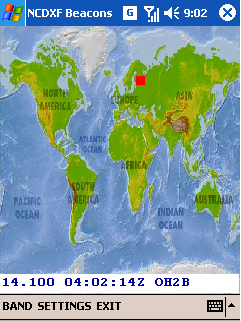 Displays currently transmitting NCDXF beacons on the world map. Syncs time on your device with internet time server on startup to ensure correct beacon is displayed. To install – unzip and copy CAB file to your device either using Active Sync or the new Windows Mobile Device Center. You can pick where you want to place it – e.g. in MyDocuments or on the memory card (Storage Card). After copying the file over to your device, open the folder (using File Explorer), highlight the file and either tap it with your stylus (Pocket PC Device) or hit the OK key (Smartphone) and it will begin the installation process. Please send your feedback and/or future requests to my gmail email account: va3paw (at) gmail (dot) com or leave a comment below. THE SOFTWARE PRODUCT IS PROVIDED AS IS WITHOUT WARRANTY OF ANY KIND. TO THE MAXIMUM EXTENT PERMITTED BY APPLICABLE LAW, THE AUTHOR FURTHER DISCLAIMS ALL WARRANTIES, INCLUDING WITHOUT LIMITATION ANY IMPLIED WARRANTIES OF MERCHANTABILITY, FITNESS FOR A PARTICULAR PURPOSE, AND NONINFRINGEMENT. THE ENTIRE RISK ARISING OUT OF THE USE OR PERFORMANCE OF THE SOFTWARE PRODUCT AND DOCUMENTATION REMAINS WITH RECIPIENT. TO THE MAXIMUM EXTENT PERMITTED BY APPLICABLE LAW, IN NO EVENT SHALL THE AUTHOR BE LIABLE FOR ANY CONSEQUENTIAL, INCIDENTAL, DIRECT, INDIRECT, SPECIAL, PUNITIVE, OR OTHER DAMAGES WHATSOEVER (INCLUDING, WITHOUT LIMITATION, DAMAGES FOR LOSS OF PROFITS, BUSINESS INTERRUPTION, LOSS OF INFORMATION, OR OTHER PECUNIARY LOSS) ARISING OUT OF THIS AGREEMENT OR THE USE OF OR INABILITY TO USE THE SOFTWARE PRODUCT, EVEN IF THE AUTHOR HAS BEEN ADVISED OF THE POSSIBILITY OF SUCH DAMAGES.